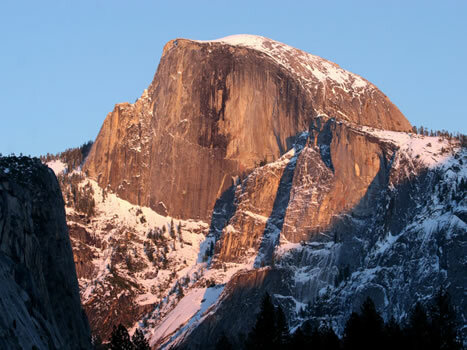 Half Dome, Yosemite National Park, California, U.S.A.
Hercules and Amazonia are the Elohim of of the Blue Ray of God's Will. 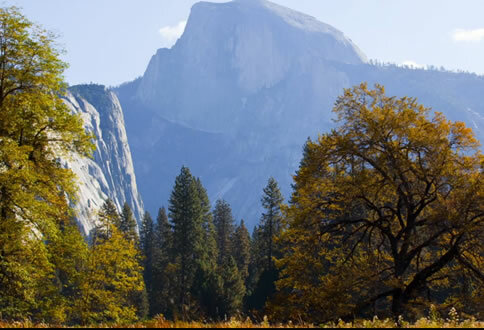 The Retreat of Hercules and Amazonia is superimposed in the etheric plane over and within Half Dome in Yosemite National Park in California. Located on the west side of the Sierra Nevada mountain range, this magnificent focus rises nearly a mile from the floor of Yosemite Valley. The Sapphire Blue Flame radiates God’s Will to the entire Earth, functioning as a Sacred Power Center — the Throat Chakra of the planet. One enters this Retreat through a large portal between two gigantic white pillars into an octagon-shaped hall, each side leading to another room. In the center of the retreat is a large blue-white diamond that intensifies the Radiation of the Elohim. One can immediately notice the accelerated activity of students, masters, and angels serving in this Retreat to focus the energies of the Will of God in cooperation with the Brotherhood of Light. Angels of the Blue Flame, Seraphim, Cherubim, Angel Devas, as well as those ministering to all of the seven rays are coming and going, each intent on rendering a specific service for the Brotherhood. This octagon room glows with the Fiery Love of the Elohim and the Angels for the Will of God. A bright blue permeates the atmosphere and is both inviting and invigorating to those who are privileged to enter here. After crossing the octagon-shaped hall, one can descend a flight of stairs to a circular room. In the center of this room is a Focus of a large Blue-White Diamond with the Flame of Hercules and Amazonia blazing through it. In every Retreat of the Elohim, there is a Focus of the Sacred Fire that is maintained at all times. A circular stairway ascends around the periphery of this room to the floor above where these is a Council Chamber. This room is built on a series of circular platforms, and at one side are the thrones of Hercules and Amazonia. There are accommodations for several hundred guests - members of the Great Brotherhood of Light - Great Sisterhood of Light - who often meet with the Elohim to discuss strategies for the externalization of the Great Divine Plan and the Will of God on the Earth. Behind the thrones of Hercules and Amazonia is a passageway leading to another room. Attendees of Council meetings pass through other doors to the right and to the left of the thrones into another circular chamber that contains the main Focus of the Blue Flame of the Will of God.